We were walking down Southern Avenue, when we met this pretty fashionable belle, Agnisha. Taken by her chic and urban style, we couldn’t help asking for her fave fashion haunts. And oh my, we were gobsmacked when she did the reveal. Dressed simply without any ornamental fuss, dancer and photographer Agnisha caught our eyes with her poise and colour coordination. 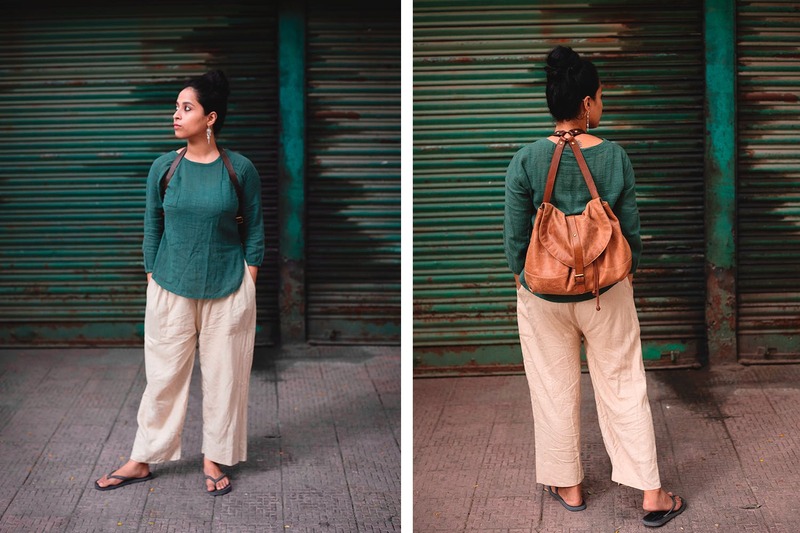 She had a simple full-sleeved khadi bottle green top as an upper (the earthy colour complimented the rest of her muted neutral look fantastically). Agnisha says she found it in one of the street stalls in Gariahat for just INR 100. Which just reasserts that Gariahat’s pavements are indeed a shopper’s paradise where (if you have the eye) you can find trendy stuff quite cheap. Check here to know more. Nothing compliments vibrant hues like a neutral colour. Agnisha wore off-white linen trousers to compliment her top. She picked it up for just INR 300 from the pavement stalls that stretch from the Grand Hotel to the Indian Museum. We’ve been there and can tell you that this is a great haunt to pick comfy and fashionable pants, graphic tees and canvas bags. Keeping up with the uncluttered boho look, Agnisha wore simple black flip flops to complete the look. Bought for a mere INR 150 from Bata, these make for a comfortable and useful wear on a moody summer evening that can break out into showers any time. Fond of a subtle muted look, Agnisha accessorised her look with a pair of silver earings, a gift from a friend. You can pick up silver or oxidised jewellery to complete the look for as low as INR 300 from the slew of stores in New Market. Check here to know more.